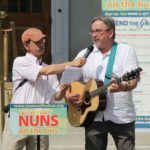 We're all riding with the nuns on the bus! We've got issues that we need to discuss! get on board and ride with us! Now's the time to Mend the Gaps!